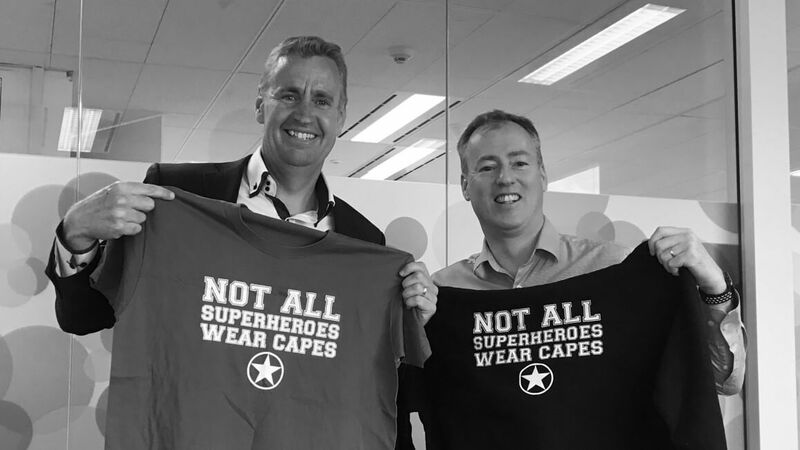 Blog > Telecom > Not all superheroes wear capes. In the early hours of an ordinary Wednesday morning, Fionan McDonnell, NSW Sales Manager and Brent Henley, CFO at Macquarie Telecom, hit the pavement for their daily run. Little did they know it wasn’t going to be an ordinary kind of day. After going past Mrs Macquarie’s Chair, they head back to the office. While they wait for the lights to change on the corner of Kent Street in Sydney’s CBD, a ute approaches, driving slightly faster than expected. In a moment of disbelief, they realise that the vehicle was not slowing down. To their horror, they watch as the car careens into the side of a taxi, turning it around with the force of the impact. A following motorcyclist, drops and slides into the back of the carnage. Fionan and Brent quickly jump to action. Fionan rushes over to the taxi and motorcyclist, assessing both. They’re shaken and bruised, but not severely injured. In the meantime, Brent checks on the driver of the ute, who was dazed by the experience. He gets out of the car and appears a bit hazy. It looks like a serious situation seemed to have resulted in no major injuries. Suddenly the ute starts rolling back down the hill. The driver has gotten back in the seat, attempting to move the car. The vehicle completes a reverse U-turn off the foot path back into the centre of the road, narrowly missing a few cars and pedestrians. The car stops and for a minute onlookers hope that it will not move. It then starts rolling down the street in the direction of Barangaroo. The driver is in shock and clearly not in control of his actions. Fionan realises that the ute is heading towards a major footpath in peak hour. He shouts warnings to pedestrians but realises that he needs to act. Rushing over to the passenger side, as he jumps in through the window, managing to steer the vehicle and preventing it from rolling down the street. Unbelievably, he pulls the handbrake and brings the vehicle to a stop. The driver stumbles out and flees the scene. It is amazing that no one else was injured. Fionan has undoubtedly saved lives and prevented serious injuries. Checking in on the drivers and ensuring emergency personnel have attended, the guys continue back to the office with the rest of their run club. Emergency workers praised the actions of both men, reiterating that there is a hero in all of us. Great work Fionan and Brent, we’re proud to call you our heroes.